Origin and Habitat: Deuterocohnia brevifolia is native to Argentina (Catamarea, Sierra de Anconguija; Tucuman, Quebrada de la Hoyada; Jujuy, El Volcani; Salta, Pampa Granda) and Bolivia: Valle de Tambo. 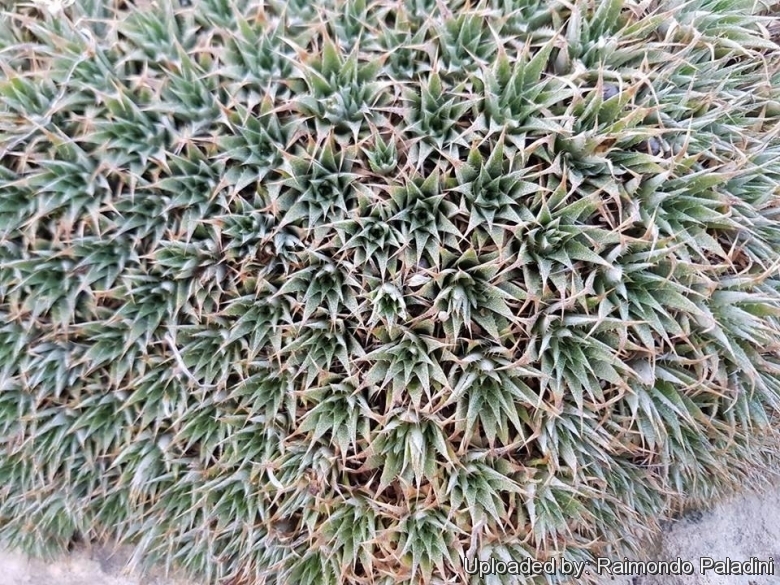 Description: Deuterocohnia brevifolia (Abromeitiella brevifolia) is a dwarf, succulent, bromeliad growing terrestrially. It forms 3-5 cm wide rosettes of lance-shaped to triangular stiff, fleshy, leaves that proliferate via offsets to form a compact rounded 'mound' up to 90-180 cm in diameter. These colonies from a distance often look soft and moss-like but they are anything but soft and cushy and touching or sitting on a plant would but more like encountering a bed of nails. Inconspicuous green flowers are borne on short inflorescences. A. brevifolia, distinguished by its relatively smooth leaf margins, has both a large and a small form, the latter (often with many marginal teeth) sometimes sold under the synonym A. chlorantha. Rosettes: Small, star-like, compact of elongated triangular leaves about 3 cm long, thick and fleshy with spineless margins. It is a very variable species from quite variable habitats. In humid, seasonally wet areas the little rosettes can be green, glabrous and glossy but in more arid locations the plants leaf surfaces can posses varying amounts of trichomes giving the rosettes a greenish-gray appearance. Leaves: Simple, basal, and sessile. Ovate-triangular, 2-3 cm long, at the base 8-14 mm wide, tapering, margins spineless or spiny (subsp. chlorantha), fleshy-thick. Flowers: 'cannon-shaped' about 32-33 mm long, 6-7 mm wide, greenish to bright green. Taxonomy: Deuterocohnia brevifolia was already described and the name validly published by August Heinrich Rudolf Grisebach. It was Michael A. Spencer and Lyman Bradford Smith, however, who reclassified it into todays valid botanical systematics in 1992. Cultivation and Propagation: Deuterocohnia brevifolia (Abromeitiella brevifolia) is a peculiar little plant occurring in dense, pillow-like clusters, suited to plant between stones or even into flat bowls into clayey ground in the greenhouse for succulent plants. Grow it like succulents in in full sun to light shade and well drained soil. They are slow growing and very drought tolerant. They should be watered regularly especially during summer months, keep dry in winter. It is probably one of the cold hardiest of the bromeliads, but detesting winter wet on its foliage, proves difficult to keep outside. When grown in pots it tends to spread out uniformly in all directions and given enough time makes a mound of foliage in the shape of a basketball cut in half that completely obscures the pot. ? Propagation: Deuterocohnia brevifolia is propagated by division and from seed when available. Among the smaller species, it is a natural addition to a succulent collection.